When the Lion Roars is a collection of essays, prayers and invocations, and ritual suggestions, all written in celebration of the lion-headed Egyptian Goddess who is also known as the Eye of Re. She is a warrior who is both death-dealer and, to a lesser-known extent, life-giver. Sekhmet made Herself known to me several years ago, and we’ve had a complicated relationship since, to say the least. So when Rebecca told me this book she was participating in, I was eager to see the finished work. 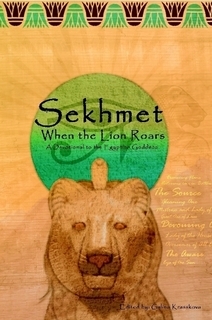 My efforts to learn more about Sekhmet’s history and nature have proven less than fruitful: what few sources I have located which had more than a vague, cursory paragraph or two have also offered largely contradictory information. Which is not to say that this book will rectify those contradictions, per se — my guess is that even in the days of Egypt, stories differed because we have always taken what we need from myth and legend, changing them to suit our needs. In any case, I was happy to find material here (most notably in Edward Butler’s essay) which I have never encountered before. More importantly, the book offers the insights of those who have also dealt with this relatively (and regrettably) little-known deity. Even when one finds one’s experiences at odds with another’s, there is always something to be learned from new perspectives — and joy to be found when experiences are similar. Even when we come from different walks of life — one a warrior and one a storyteller, for example — Sekhmet has a distinct approach. There were more than a few times when I found myself nodding my head in understanding and rueful sympathy. It helps when the writers write engagingly and eloquently. On the whole, this is no dry, academic text, even when it’s giving instruction. To be honest, poetry and mantras aren’t usually appealing to me, so the prayers and invocations of the book was largely lost on me, but there were still a few that I found appealing, and several that were also informative of Her history. The book is currently selling for $18.00 for the 109-page paperback, and $5.00 for the e-book. Though pricey for its slimness, it is a lovely book, the nature of which (a work devoted to Sekhmet) is, as far as I’ve encountered, otherwise non-existent. That makes it well worth getting a hard copy.